On my 49th birthday I made a promise to myself. By the time I’m 50 I will have a new job. I’ve been at my current job for 18 years (yes 18!!!!) and I really needed a change. Of course after the vow was made I got busy with life and the time to look for a new job just couldn’t be found. I teach drama and run my own drama company for children on Saturdays – so add in my writing on top of that and there’s isn’t much ‘job-hunting’ time left. The thought of doing an interview (my first in 18 years) filled me with dread. I came up with all sorts of excuses until the day before it was due and then my husband shut me in a room and said, “you’re not coming out until you’ve done it!” A few days later they rang to offer me an interview and informed me that I would have to teach a lesson. Anyone who knows me knows that I HATE being watched and the thought of someone watching me teach a lesson in an interview situation nearly finished me off. I would also have to do a written task (?) and a face to face interview. I spent four days planning a 30 minute lesson (I can laugh now) I over-planned, changed the plan, had several nervous breakdowns and eventually came up with something that I thought might be OK. When I got to the school (very friendly, liked it straight away) I discovered there were four other applicants (they were all younger than me, more confident, better in every way) I was first up to teach. I was so nervous my tongue was stuck like glue to the roof of my mouth making it very difficult to speak. The children were lovely, they seemed to like what I’d planned and I relaxed in to it a little. It’s the most wonderfully creative book with carrot sticks flying to Jupiter and all sorts and I decided to base my fictional drama lesson around it. After this it was the face-to-face interview – it went okay, not brilliant but then I didn’t faint or run out in tears, so it went okay! 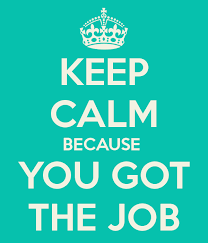 Half-an-hour after I got home, wrung out and in need of a holiday the headteacher rung to say I’d got the job and would I be free to start in September! I thought I was hearing things. I couldn’t believe it! A new job, a month before my 50th birthday. The point of this post is this. Applying for that job, going for that interview and especially teaching that class while being watched and judged, was so far out of my comfort zone there isn’t even a zone to describe it, but I did it. I’m not even sure how, but if I can do that then basically you can do it too! Not apply for a part-time teaching job (unless that’s your dream) but anything you want to do but feel too scared to try! It’s scary but it’s so worth it – and if you want to know how the job goes when I start – watch this space! I so agree with this! Scare yourself a little everyday! thanks and yes a bit of fear goes a long way sometimes. I could do my old job with my eyes shut but where’s the fun in that??? Thank you so much. That inspires me. I think I may have to do something very out of my comfort zone – and you have given me hope it will be OK! And congratulations on your success!